1. Mix the shredded cheeses together with the pimientos. Stir in the mayonnaise. With a metal spoon (pimientos will stain plastic or wood), stir until the mixture is well blended. Add salt and pepper to taste and stir again. Keep covered in the fridge until ready to use. 2. Serve with corn chips or bread. Enjoy! yummm. Isn't it amazing that folks north of the mason dixon line haven't heard of this stuff? I was introduced to it in AL, and back here in NY I get weird looks when I mention it. 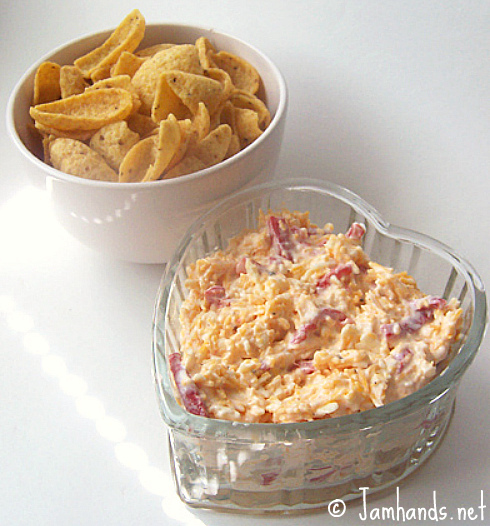 Oh I love pimento cheese! This recipe looks so easy too! I always add some lemon juice to mine as well.